The Cisco ASA 5500-X Series next-generation midrange security appliances uses the Cisco SecureX framework to provide a context-aware approach to security. These next-generation security appliances deliver multiple security services, multigigabit performance, flexible interface options, and redundant power supplies—all in a compact 1-RU form factor. The Cisco ASA 5500-X Series midrange security appliances provides additional network security through optional integrated cloud- and software-based security services that use identity for security policy selection, requiring no additional hardware modules. Built on the same proven security platform as the rest of the ASA family of security appliances, the Cisco ASA 5500-X Series midrange security appliances delivers superior performance for exceptional operational efficiency. A key component of the Cisco® SecureX Framework, the Cisco ASA 5500 Series integrates the world's most proven firewall with a robust suite of highly integrated, market-leading security services for networks of all sizes - small and midsize business with one or a few locations, large enterprises, service providers, and mission-critical data centers. The Cisco ASA 5500 Series delivers MultiScale™ performance and functionality with unprecedented services flexibility, modular scalability, feature extensibility, and lower deployment and operations costs. 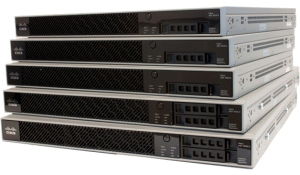 The Cisco ASA 5525-X, 5545-X, and 5555-X are next-generation midrange security appliances that use the Cisco SecureX framework for a context-aware approach to security that delivers multiple security services, multigigabit performance, flexible interface options, and redundant power supplies - all in a compact 1-RU form factor. These appliances optionally provide additional broad and deep network security through an array of integrated cloud- and software-based security services that utilize identity for security policy selection, with no need for additional hardware modules. They are built on the same proven security platform as the rest of the ASA family of security appliances, and have been designed to deliver superior performance for exceptional operational efficiency. With up to 4 Gbps of firewall throughput, 1,000,000 concurrent firewall connections, 50,000 connections per second, and six integrated 10/100/1000 Fast Ethernet interfaces, the ASA 5525-X, 5545-X, and 5555-X are excellent choices for businesses requiring a high-performance, cost-effective, extensible security solution that can grow with their changing needs. 4X increase in firewall throughput protects users as their current and future data consumption demands increase. Additional security services can be enabled quickly and easily, without requiring additional hardware. Multicore enterprise-class CPUs deliver more powerful, efficient performance. Additional copper and SFP Gigabit Ethernet ports provide greater flexibility during network configuration. Dimensions (H x W x D) 1.67 x 16.7 x 15.6 in. (4.24 x 42.9 x 39.5 cm) 1.67 x 16.7 x 19.1 in. Download the Cisco ASA 5500 Series for Internet Edge Data Datasheet (PDF). Download the Cisco ASA 5500-X Series Specsheet (PDF).